After 25 years of experience with dozens of gutter guard products from a variety of manufacturers, Dunn Construction has chosen to partner with Rhino Gutter Guard as a certified dealer. The Rhino Gutter Guard’s embossed texture and minimal surface area prevents leaves and debris from sticking and increases shedding. Rhino also reinforces gutter-strength, because it’s screwed to the fascia board during installation and never attached to a roof shingle. Our customers give Rhino Gutter Guards an enthusiastic thumbs-up and we’re confident you’ll love this high-quality product, too. To ensure peak gutter performance, Rhino recommends an annual inspection of your gutter guards by an authorized dealer—but that’s easy. We’re just a phone call away. Rhino Gutter Guard is made with stainless steel micro-mesh over embossed expanded aluminum products. The body uses .024 aluminum that is mechanically fastened over the mesh laminate creating a stronger product in both compression and tension. The embossed texture deters debris from sticking to the product by minimizing surface contact area increasing debris shedding. Starting at the end of the gutter of your choice, begin with the first 5-ft piece of gutter guard and matching end cap. Install the first 5-ft section along with the matching end cap with three ½-inch zip screws into the front top edge of the gutter and the first section of Rhino. Then slightly raise the back of the Rhino at the vertical upward bend and insert three 1½-inch screws through the fascia board and the Rhino. By screwing through the fascia board, it greatly strengthens the gutter and establishes the slight slope that makes debris shedding possible. 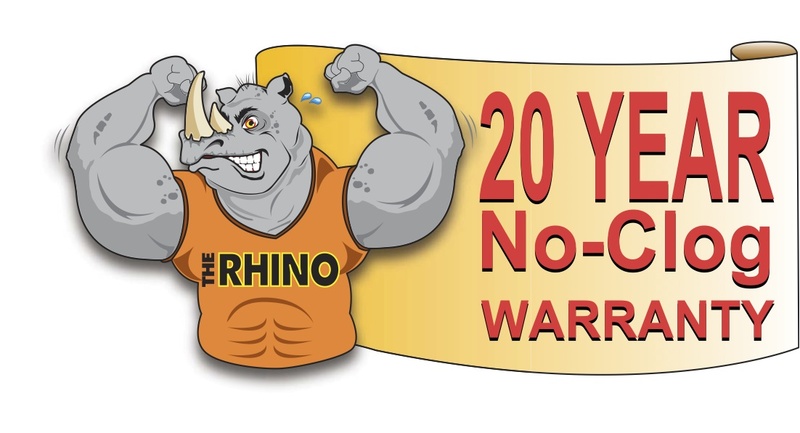 The Rhino never has to attach to any roof shingle at any time. There is no such thing as a maintenance free gutter protection product. 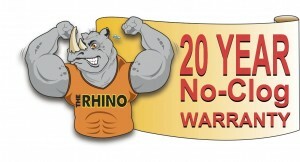 Rhino suggests having an annual inspection by an authorized dealer to make sure there are no issues. The Rhino will take huge volumes of water and the slight slope should shed most, if not all, of the debris.